Declination > -30° 09' 30"
The lower shutter (or windshield) causes vignetting for zenith distances > 57 degrees so it should be raised for such observations. The plot below shows the area of sky accessible to the INT in terms of declination and altitude. The area of sky accessible to INT in terms of declination and hour angle, is shown in the figure below, where the the lines of equal zenith distance are drawn. 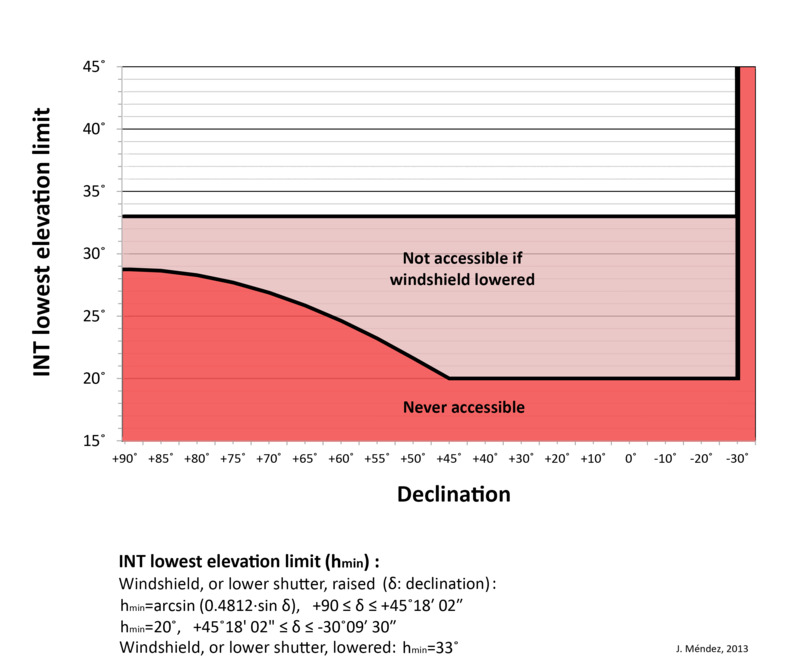 This plot includes the area visible when the lower shutter is raised for low-altitude observations. A detailed description INT optics and mount is available at the Observers' Guide. For INT Telescope Control System information please see the INT TCS manual.